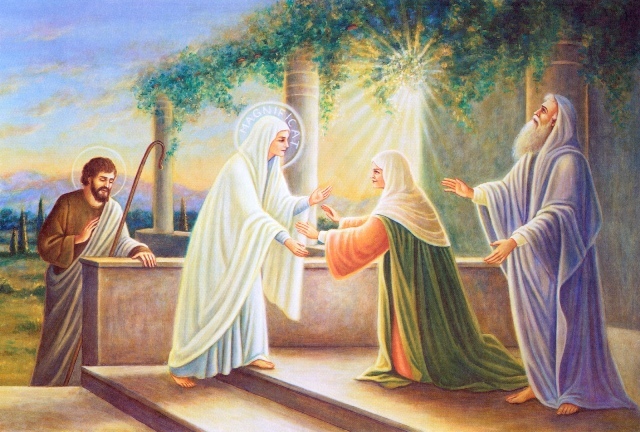 Assuming that the Annunciation and the Incarnation took place about the vernal equinox, Mary left Nazareth at the end of March and went over the mountains to Hebron, south of Jerusalem, to wait upon her cousin Elizabeth, because her presence and much more the presence of the Divine Child in her womb, according to the will of God, was to be the source of very great graces to the Blessed John, Christ's Forerunner. The event is related in Luke 1:39-57. Feeling the presence of his Divine Saviour, John, upon the arrival of Mary, leaped in the womb of his mother; he was then cleansed from original sin and filled with the grace of God. Our Lady now for the first time exercised the office which belonged to the Mother of God made man, that He might by her mediation sanctify and glorify us. St. Joseph probably accompanied Mary, returned to Nazareth, and when, after three months, he came again to Hebron to take his wife home, the apparition of the angel, mentioned in Matthew 1:19-25, may have taken place to end the tormenting doubts of Joseph regarding Mary's maternity.